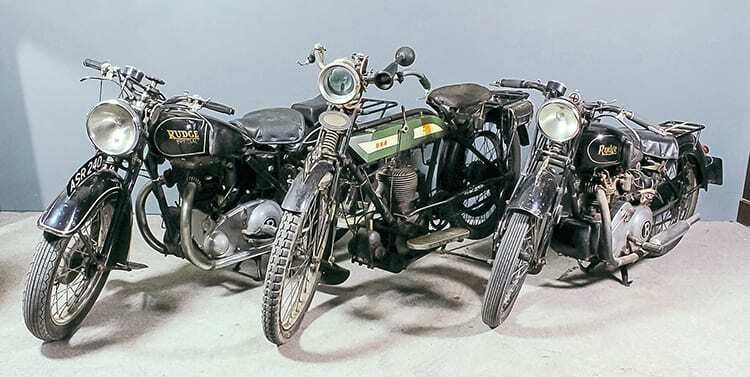 Three vintage motorcycles, one dating from 1913, that have been in the same father and son ownership for decades, are included in a sale at The Canterbury Auction Galleries. The ‘Pioneer’ 1913 500cc, a 1934 250cc Rudge Radial and a 1936 500cc Rudge Special will be offered in the saleroom’s two-day sale on October 2/3. They were owned by banker William Martin, who passed his lifelong passion for motorcycles on to his son, James. They attended shows and rallies together, including the Pioneer Run, entering the BSA on a regular basis and collecting a total of eight finishers’ medals. James inherited the trio of machines on the death of his father, taking them to France with him when he retired to live in Limoges 20 years ago. Each is accompanied by a comprehensive file showing details of purchase, parts obtained and copies of all documents. The motorcycles will be offered at the auctioneer’s rooms at 40 Station Road West, Canterbury CT2 8AN. For further information, please contact 01227 763337.